What is it with clocks here? I went back and counted: so far this year there've been 33 posts featuring various clocks. Give the gift of time with our wonderfully innovative gear clock. 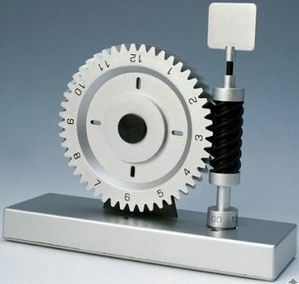 Watch the mesmerizing motion as the gears go around and around while displaying every hour, minute and second of the day. The stylish silver-toned and black colors add to the modern look and feel of this extraordinary time piece. An eye-catching addition to any room or office. Measures 7-5/8" long by 6" high x 2-1/2" deep.